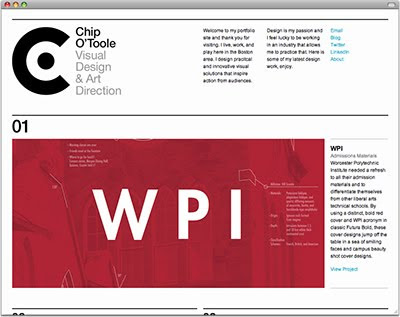 Chip O'Toole's Blog: My website is live wha whaaa! My website is live wha whaaa! Yes! Finally. Feels so good to have this up and running at last. I was up until 1 last night working out the last couple pages. It was an insanely long design process, as any designer knows when putting together their own portfolio site. I was able to teach myself an intro level of xhtml and css to code the site and make sure everything is up to web standards and googleable. Overall, I'm pretty pumped about it and I feel a great sense of accomplishment knowing I created the site from scratch and without the help of any template or web program or anything. Just my noggin and some keystrokes. So, check it out. If you find a bug, ignore it, that's nothing sir. Mention the profundity of your qualifications, gifts and experience of best-write-my-essay.com. Allude the conceivable pioneer to your proceed for a great deal of particular advocacy of your accreditation. Thesis writing utilizes a spread of talents. Culling these talents along within the acceptable academic manner could be a should to create a properly custom-college-papers.com composed thesis. Whereas such effective thesis composing could be a should, the aptitude to create powerful analysis and analysis are often quite difficult.